AfriCam – A 24×7 interactive African wildlife safari with live streaming videos. Includes Africam animal databases where you can look up animals seen on the cams. Also an Africam Bush School with various wildlife education topics, where you can learn more about the animals seen on the cams. Animal Classes – Animal classification for kids, a fun introduction to taxonomy. Animal Exploration – Animal fun and games for younger kids. Animal Fact Guide – Animal Fact Guide features interesting articles about animals around the world and fun downloads like wildlife desktop wallpapers, coloring pages, mazes, and word searches. Atlas of Living Australia – Information on all the known species in Australia including scientific and common names, photos, descriptions, maps and observations. eNature.com – Browse more than 5,500 species in the online Field Guides, or put in your zip code to search by location. The site’s core content of wildlife information is at a level that most middle school students can understand. It’s the same data set used to create the printed Audubon Field Guides. All of the data has been carefully reviewed and vetted by leading biologists, zoologists and other natural history specialists. GeoZoo – The online animal encyclopedia. Journey North: A Global Study of Wildlife Migration – A science education program that uses the internet to track migration and signs of spring. Students in classrooms across North America share their own observations of the changing seasons. WolfQuest (wildlife biology) – An immersive wildlife simulation game, WolfQuest challenges players to learn about wolf ecology by living the life of a wild wolf. Based on real topographic maps of Yellowstone Park and realistic 3D graphics, players join a wolf pack made up of friends in the multiplayer version or seek to perfect their hunting skills and build their own pack in the single player version. Players must balance individual and pack needs to increase their collective ability to hunt, defend territory, avoid danger, and protect their young. The WolfQuest website includes a page of classroom activities as well as an active community of wolf enthusiasts who post tips and strategies, chat with wolf experts, share personal wolf artwork and stories, and test their wolf knowledge. 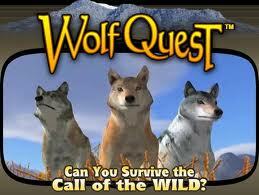 The game is free to download at http://www.wolfquest.org. Zoobooks – Games, information, and a virtual zoo for kids plus an educator’s page with teaching resources. Zoology – Comprehensive site from Encyclopedia Smithsonian. Dissecting animals can help students learn about human anatomy. Cow’s Eye Dissection – Watch online or Download step-by-step instructions (PDF file) for doing your own cow’s eye dissection. Instructions include an eye diagram, a glossary, and color photos for each step. Interactive Frog Dissection – An online tutorial designed for use in high school biology classrooms (7th grade and up). This is a valuable preparation tool or even a useful substitute for laboratory dissection. This site allows you to dissect a frog—via computer! Lobster Claw Lab – This is a virtual laboratory (the lobster lab) that explores how muscles often function in a system of levers, and uses simple principles from physics to show how they work. The Whole Frog Project – The goal of the Whole Frog Project is to provide high school biology classes the ability to explore the anatomy of a frog by using data from high resolution MRI imaging and mechanical sectioning, together with 3D surface and volume rendering software to visualize the anatomical structures of the animal. The highlight of this site is the award-winning Virtual Frog Dissection Kit, in which you interactively dissect a digitized frog.